This color periodic table looks like my other printable periodic tables. On closer inspection, you will realize the element names are different. 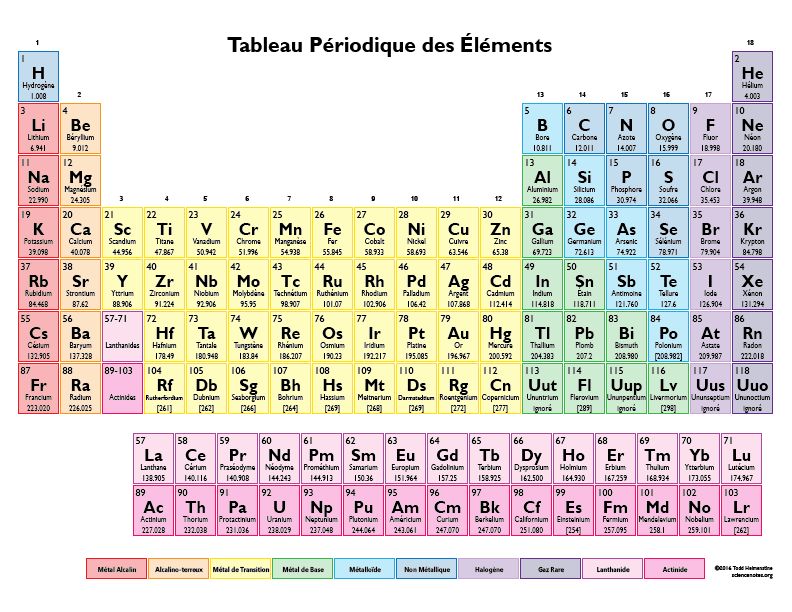 This is a color periodic table in French, or Couleur Tableau Périodique des Éléments. Each element is represented by its number, symbol, atomic mass and French name. Each color represents the different element groups — also in French. This table is optimized to fit on a standard 8½” x 11″ sheet of paper and a PDF is available for download. If you don’t have a color printer, or would prefer your table to be monochromatic, there is a black and white version. *Note* My French is around the level of Grade 6 “My aunt has a pen on the table.” and counting to twenty. If I’ve made an error, feel free to correct me in the comments section below. Hi, I love your site. I’m looking for a black and white Periodic Table with Electronegativity values. Would you have one available? Thank you.